From Middleton. - The Register, Adelaide, 19 September 1914, p. 9. Middleton. - Southern Argus, 24 September 1914, p. 3. The late Private A. Hiltunen. - The Advertiser, Adelaide, 9 January 1917, p. 8. Late Private A. Hiltunen. - The Register, Adelaide, 9 January 1917, p. 5, portrait. Port Elliot. - Southern Argus, 11 January 1917, p. 3. 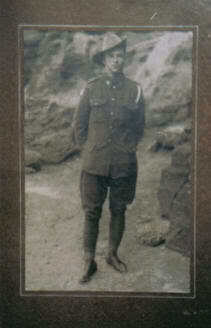 The late Private A. Hiltunen. - Chronicle, Adelaide, 13 January 1917, p. 45. A soldier's monument. - The Register, Adelaide, 7 July 1917, p. 8. The late Private Hiltunen. - The Advertiser, Adelaide, 3 July 1917, p. 6. The kindly Mrs Trigg brings to mind Basil Greshner's 'old lady' from Winchelsea -- there must have been many who, unsung, opened their hearts to these strangers. The effect of such kindness can be far-reaching; when war broke out Hiltunen felt impelled to repay the debt, but his was a short, tragic life [...].